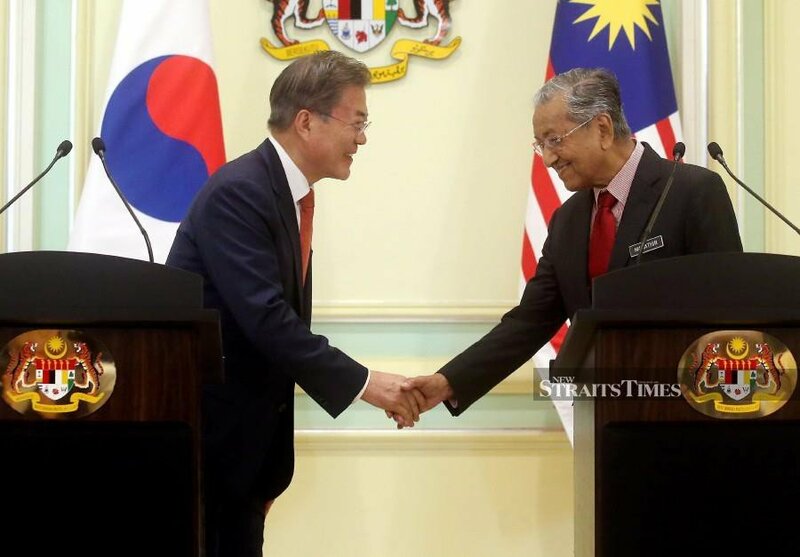 PUTRAJAYA: Malaysia is keen to continue sending students to South Korea, said Prime Minister Tun Dr Mahathir Mohamad. He said Malaysian students should be sent there to study engineering, Information Technology (IT) and new technologies. By doing so, Dr Mahathir said Malaysia could follow in South Korea’s footsteps in terms of its progress and development. “I have also been pointed out by the South Korean president that his country began its industrialisation process by making a car. And, look where they are today. We are very impressed indeed. “We also started (Malaysia’s industrialisation process) with (making) a car, but we have not done as well as the Koreans,” said Dr Mahathir in a joint press conference today after the talks with South Korean President Moon Jae-in and his delegation. The prime minister also expressed Malaysia’s hope to see the relationship between North and South Korea improves over the years. “We hope an agreement will be reached between the North Korea and the United States on disarmament. “As such, we expect to see peace and stability in this part of the world,” said Dr Mahathir. The prime minister also said Malaysia and South Korea shared similar views at international meetings. Earlier, Moon and Dr Mahathir had witnessed the signing of four memorandums of understanding (MoUs) involving industrial cooperation relating to the Fourth Industrial Revolution (Industry 4.0); cooperation in the field of transportation; the development of a Smart City in Malaysia; as well as cooperation in the halal industry. With these MoUs, Dr Mahathir believed trade and relation between Malaysia and South Korea would be enhanced. The prime minister said there were a lot of areas of cooperation in industrialisation that both nations could embark on. Dr Mahathir even expressed his hope that with Moon’s visit here, Malaysia could fully benefit from South Korea’s advances. Last year, Malaysia and South Korea’s bilateral trade recorded an upsurge of 7.2 per cent to reach USUS$17.98 billion (RM72.60 billion) compared to US$15.76 billion (RM67.71 billion) in 2017. South Korea was Malaysia’s eighth largest trading partner globally and the 13th largest source of Foreign Direct Investment (FDI) in 2018. Also, Malaysia was South Korea’s 14th largest trading partner in the same year. Moon, accompanied by his wife Kim Jung-sook, is here for a three-day state visit.